Home » Team » Jasmine S.
Jasmine joined the Hanover Veterinary Hospital and Walkerton-Hanover Veterinary Clinic in the spring of 2019, first as a high school co-op student and then as an Animal Care Attendant. 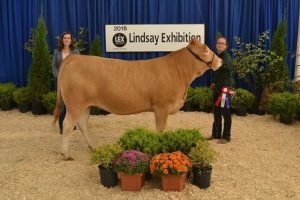 She currently lives on her family farm outside of Mildmay where they raise purebred Blonde D’Aquitane cattle. Jasmine plans to continue her education next fall at the University of Guelph where she hopes to become a large animal veterinarian. In her spare time she enjoys participating in Beef 4-H, playing soccer, rugby and guitar, snowboarding and spending time with her husky Frisky.